Richard Pachter: The Secret History of Lazard Frères & Co. Though well researched and authoritative, this history of the Lazard Frères' investment firm may not be of interest to those not involved with the firm. 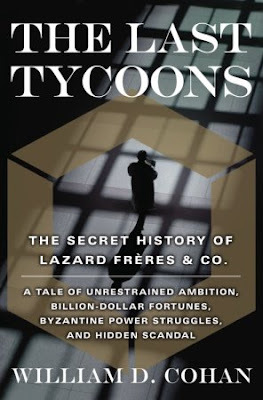 The Last Tycoons: The Secret History of Lazard Frères & Co., The World's Most Elite and Enigmatic Investment Bank. William D. Cohan. Doubleday. 752 pages. Corporate histories and exposés are dicey things. Even when the subject is fairly familiar, there still needs to be a compelling narrative with good guys, bad guys and enough revelations to keep things interesting. And if you are an insider, ex-employee, client or are otherwise well acquainted with the company being profiled, you are bound to be more interested and aware than other readers. For example, I once shared a book on the Coca-Cola Co. with a manager who formerly worked for the firm. He later reported that he'd enjoyed it but that its picture of the organization was quite incomplete. A book providing a complete and detailed portrait of any company would have to be so huge that it would be unwieldy and so ponderous that it would be virtually unreadable, making it unlikely to be widely read and to attain popular success. The Last Tycoons comes close, which is not necessarily a good thing for all concerned. Author William Cohan worked at the Wall Street firm of Lazard Frères for six years and was later a managing director at JPMorgan Chase & Co. and an investigative journalist. In writing this book, which has been promoted as the first full look at the firm, a major financial powerhouse, he brings his ample professional accomplishments in both fields to bear. Lazard is seen by many as an Old School behind-the-scenes force in the market, in politics and in other dominant institutions. The firm was closely held by family members throughout much of its history, so few details about its colorful owners and managers — other than mostly packaged and pre-spun stories — have appeared in the press. Profiles of former head Felix Rohatyn and current CEO Bruce Wasserstein are ubiquitous, but Cohan offers a different view of each. Detailing the firm's founding and establishment in America and parallel development in Europe, Cohan proves an amiable and intelligent tour guide. In addition to his ample knowledge of business, finance and human nature, he also places events in their historical context, a clear byproduct of his research. With a rather large cast of characters, Cohan strives mightily to create vivid and detailed portraits of the principals by invoking as many personal traits and anecdotes as possible without overburdening the reader. Still, throughout the 750-plus pages of text and notes, characters come and go and amid the wheeling, dealing and other machinations. As inevitable weight of the tome's details drag it down, a page-turner this is not, despite Cohan's consistently elegant prose. Still, there are some especially memorable passages. How the American director of the company managed to secure safe passage for its European — and Jewish — manager only to be ousted after the aristocratic refugee settled in the states is especially poignant and revealing. And inside stories of a number of scandals in which the company was directly or peripherally involved will surely score with those of us who suspected that contemporaneous media reports revealed only parts of the tales.